Preheat the oven to 180°C/350°F. Crush garlic and remove green sprout. Zest and juice limes. Finely chop garlic, chili, and cilantro. In a large freezer bag, mix together garlic, chili, lime juice, lime zest, half of the cilantro, olive oil, and BBQ sauce with chicken until well combined. Season with salt, pepper, sugar, and paprika. Remove chicken wings from freezer bag and shake off any excess liquid. 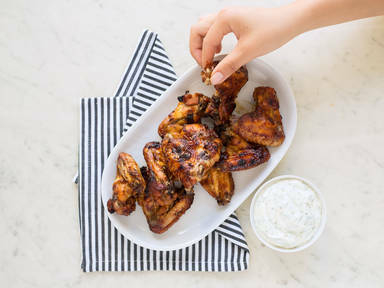 Arrange chicken wings on a lined baking tray and bake for approx. 25 - 30 min. at 180°C/350°F until golden brown. Flip wings halfway through baking time. Juice lime. In a small bowl, mix together sour cream, remaining cilantro, lime juice, salt, pepper, sugar, and olive oil. Enjoy as a fresh dip with chicken wings.